Garage Sales are all over the place this time of year, as I was driving around with my Home Buyers I must have seen at least ten in Oakland County alone. As Home Sellers and Home Owners get ready for fall and either making more room for storage or are relocating possibly even selling their home, it’s clear that avoiding them is impossible and with the great deals out there who would want to. 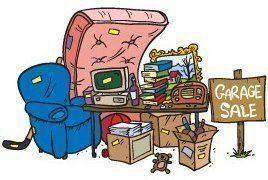 I wanted to share some tips for those who are having a yard sale in hopes it will make it easier for them and possibly have the best garage sale ever. Please share and I hope you enjoy. Go through your whole house, sorting out items you can do without. Be ruthless. Plan for the sale to run at least two days; weekends are ideal. Advertise ahead of time: Place an ad in your local paper. Distribute fliers. Stick notices on store bulletin boards and street posts (where permitted). Tell your friends and neighbors you’ll be selling your “dear old rocker,” etc. Ask friends to come and assist you on sale days. Price your things sensibly (considering the market value of a new item plus the age and condition of your sale item). Polish, clean, repair or mend everything for sale. Mark the price for each item in bold print and expect some bargaining from buyers. Clean up the garage or yard and provide good lighting. Place your sale items on tables spaced for easy passage throughout the garage. Put key items (furniture, appliances, antiques, attractive toys, etc.) up front and clearly visible from the street. Hang clothes on racks and make a screened dressing room available for try-ons. For your grand opening, float balloons in your yard near the street, stretch streamers around your garage door and hang wind chimes here and there. Provide a low-key musical background. Set up a free refreshment stand. Clear the curbside and drive for parking. Have cash on hand to make change. Accept checks drawn only on local banks and require two IDs. Have a nice sale! I have information to help you in many ways as you contemplate relocation. Call or e-mail me and put our expertise to work for you.